The government of Uganda on Sunday reached a landmark achievement by signing an agreement between the Kenyan government and the Uganda Grain Council. 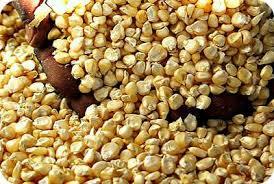 Under the contract, Uganda will supply Kenya with between 600,000 to 1Million tons of maize in one year. 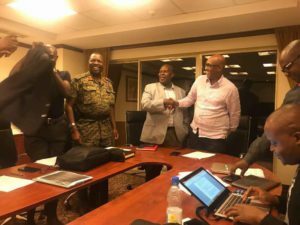 The Ugandan delegation which secured the deal was led by Operation Wealth Creation’s Deputy Chief Coordinator Lt. Gen. Charles Angina. The other delegates were the Chairman of the Uganda Grain Council, Richard Kaijuka, Dr. Charles Lagu of NAGRC and Ramathan Ggoobi from Operation Wealth Creation. Kenya’s Ministry of Agriculture projected in January that this season’s maize harvest would drop by 20 per cent of the expected 40 million 90kg bags. The drop was attributed to a combination of erratic rainfall and the fall armyworm invasion, which destroyed hectares of the crop in various parts of the country. By January this year, Kenya had received close to 3,000 tonnes from Uganda. Data from the Regional Agricultural Trade Intelligence Network (Ratin), run by the Eastern African Grain Council which monitors real-time cross-border grain trade, shows that an average 700 tonnes of maize crossed into Kenya from Uganda every day in the first week of January.